On this page you will find information about the movie, the soundtrack, and the novelization. Yes, there is a novelization. 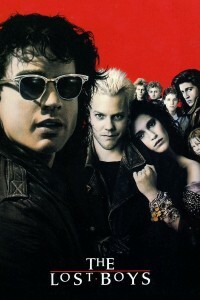 A horror-comedy, The Lost Boys was released in the summer of 1987 (I’ve heard conflicting reports of exactly when–some say July, others say August). Recently-divorced Lucy Emerson (played by Dianne Wiest) relocated her two teenage boys, Michael (Jason Patric) and Sam (Corey Haim), from Phoenix, Arizona, to Santa Carla, California (aka Murder Capitol of the World) to live with her father. Michael and his little brother Sam have quite an adjustment to make; a strange and quirky grandfather (Barnard Hughes) and a strange new town. Sam immediately finds his passion on the Santa Carla Boardwalk–a comic book store. But he gets more than he bargained for in the two teenage brothers who run the store. Edgar (Corey Feldman) and Alan (Jamison Newlander) Frog warn him about vampires by giving him vampire comic books. Michael, too, gets more than he bargained for when he meets his dream girl, Star (Jami Gertz), on the Boardwalk. He finds himself falling in with her crowd; tough bikers who are more than a bit strange. For instance, why would David (Kiefer Sutherland), Dwayne (Billy Wirth), Marko (Alex Winter), and Paul (Brooke McCarter) want to have Laddie (Chance Michael Corbitt), such a small boy, around? Meanwhile, Lucy is determined to make life in Santa Carla a pleasant experience. She gets a job at the video store on the Boardwalk. She and the owner, Max (Edward Herrmann), feel an immediate attraction for each other. When Sam notices eerie changes in his brother, he consults Edgar and Alan, who swear Michael is a vampire. The three go on a hilarious search for the head vampire, which leads to an all-out battle between mortal and immortal when the boys come face to face with The Lost Boys in the dramatic, explosive and surprising conclusion of this 80’s cult classic. Note: The above review was written by me [Sammy]. Do not use it on your site without my permission.